Now, members of the Council are eager to attend meetings in their new Innovation Center, an active workspace that features iMovR’s treadmill desks as replacements for their traditional Boardroom conference table. 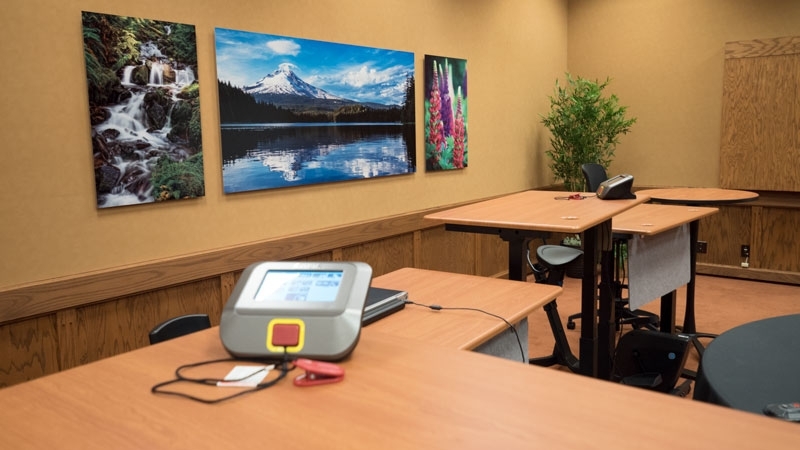 Adventist Health’s Regional President Joyce Newmyer conceptualized this unique meeting space while brainstorming with a preventive medicine physician on additional ways to better support employee well-being. She passed on the idea to Ed Hoover, the manager of the LivingWell and Community Wellness Program, who led a grant writing team to secure funding to create their active meeting room. 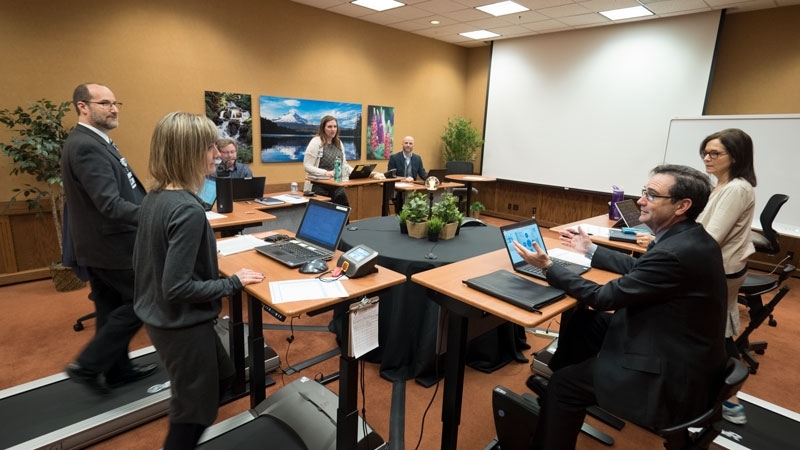 After several weeks of research, including helpful discussions with iMovR’s Workplace Wellness Solutions Specialists, Hoover’s team purchased eight iMovR Energize desks. 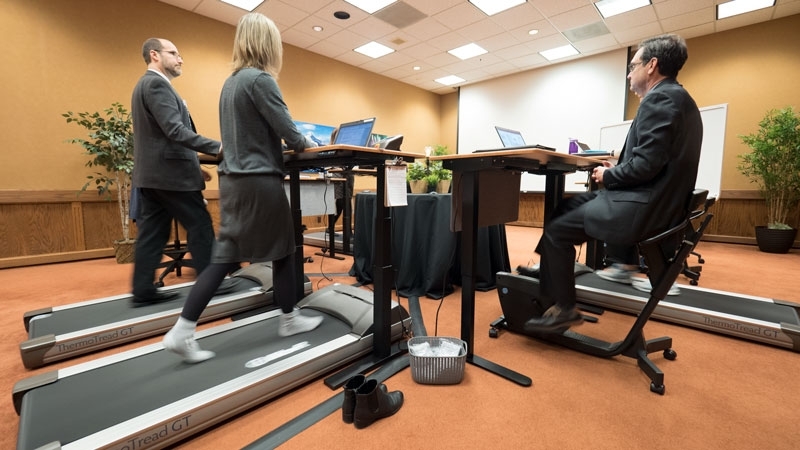 Half of the desks were outfitted with iMovR Thermotread GT treadmills, and the other half were paired with desk cycles. A couple of bistro tables and some task stools make room for up to twelve. Since the Innovation Center does not have windows, the team added inspiring nature photography and artificial plants to create a welcoming environment that fosters focus and creativity. There is also a Mission Wall that features faces from the diverse cultures and age groups that the hospital proudly serves. "The iMovR customer service team...was just amazing. They were really great in terms of responsiveness, and that really made a difference for me." Ed Hoover and the Adventist Community Wellness Program staff plan to survey employees to gain more feedback about the Innovation Center, but their preliminary findings have been overwhelmingly positive. “The biggest reward for me is seeing other people’s enthusiasm for the concept and to see people coming together to use the space,” Hoover says. The President’s Council manages the Portland Health Care Network, including Adventist Health Portland Medical Center, 33 Medical Clinics, 6 Physical Therapy clinics, and works with affiliated Adventist Health Home Care, Personal Care and Hospice services in the greater Portland/Vancouver metro area. 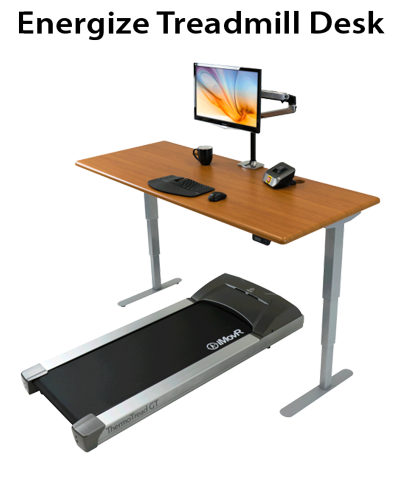 Talk with our workplace wellness specialists to discover office fitness solutions for your organization!